Having the best experience during gym time calls for a collection of ideal gym equipment and gear. If you are a yoga practitioner, then you know that among the biggest challenges of going to and from the gym or yoga class is keeping the yoga mat safe and easy to carry. Back in the day, gym bags were designed to carry a very limited number and variety of stuff. These almost always include shoes, towels, and a change of clothes. What about yoga mats, though? This was a major problem for yogis because of the fact that yoga mats are not the easiest to carry around. Today, however, there are now gym bags that are specifically designed for this purpose. Among these awesome new inventions is the YogaAddict Supreme Yoga Mat Bag. If you’ve been looking for a bag that is designed to be affordable, simple, and convenient, then the Supreme Yoga Mat Bag from YogaAddict is a good option. This well-designed bag promises to make it easier for you to get to and from the gym by having all of your stuff organized. Since this 30-inch-long bag is made from premium-quality polyester, it is very lightweight and easy to carry around. In fact, it was designed as such so that it won’t add any extra stress on your shoulder as you take it with you to and from the gym. What’s more is that the polyester fabric provides the bag with excellent durability too. Yet another thing that you will love about the YogaAddict Supreme Yoga Mat Bag is the fact that it has an adjustable shoulder strap. This means that you won’t have to worry about it not being suitable for your height; you can just simply adjust the length of the strap to your requirements. The YogaAddict Supreme Yoga Mat Bag is capable of fitting most yoga mats that are up to 27 inches wide. Despite this, this bag still has a sufficient amount of space left to store other exercise gear such as weight-lifting gloves and towels. Want to take your water bottle? You’ve got your very own compartment for that, as well. Keeping it in the separate pocket can also keep your other stuff safe from water spills. In addition to all of that, this yoga mat bag also has a very simple yet extremely functional design. In fact, it boasts multiple compartments that each play various purposes. These compartments help organize gym essentials in a convenient manner. 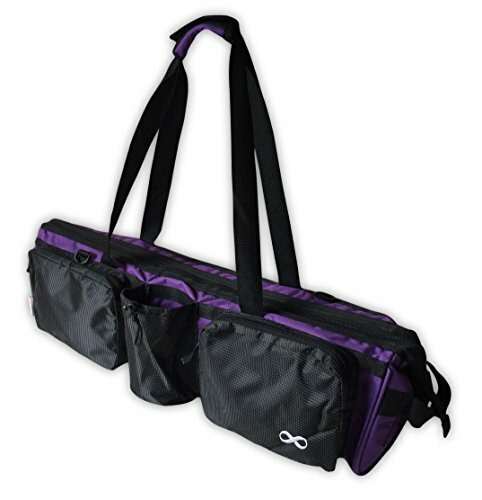 YogaAddict’s Supreme Yoga Mat Bag comes with two external compartments in the front, which can fit two yoga blocks. These compartments both measure 4 by 6 by 9 inches and offer sufficient space for your books, clothes, additional yoga straps, yoga blocks, kindles, towels, and other digital accessories. Furthermore, there is also another external compartment that is located in the middle of the bag. This compartment is designed for your water bottle. There is also a zippered pocket inside, which is where you can keep your more personal belongings in a safer space. You can store your wallet, headphones, tissues, wipes, membership cards, keys, journals, purses, and similar stuff. This means that you no longer need to take multiple bags for all your stuff to the gym anymore. You will also be delighted to know that this yoga mat bag is equipped with a high-quality full zipper. This kind of zipper closes easily and makes it easy to insert and pull your mat out. The YogaAddict Supreme Yoga Mat Bag is an ideal choice for those looking to lessen the hassles of their gym routines. It comes with not one, not two, but three smaller compartments, which you can use to store various items such as your keys, phone, and earphones. The adjustable strap, combined with the wide zipper on top, helps you carry your belongings in a safe manner. In fact, if you’re worried about your tiny and more personal items being stolen, this bag has got your back. It has its very own zippered private pocket inside for. Available in three different colors, it allows you to choose according to your liking. This two-toned black bag can be the perfect bag for your gym essentials. Let’s compare YogaAddict’s Supreme to another gym bag that gym-freaks love to invest in—the Adidas Defender III Duffel Bag. Adidas, a well-known sportswear manufacturer, second to Nike, has not been one to let people down often. As such, you can expect their products to be top-notch. First and foremost, the Defender III Duffel Bag is available in a whopping 37 colors. This makes it a better choice when compared to YogaAddict’s Supreme, which only comes in three different colors. Then again, Adidas has given its bag a heavily padded strap, which may be too heavy for some people. What the Supreme has, though, is a conveniently adjustable long shoulder strap. While the Defender III and Supreme offer the same amount of space to users, it’s important to remember that the Defender III is actually a pricey duffel bag. On the other hand, the Supreme is an affordable bag that is designed only for yoga mats and a few extra essentials. From this, we can conclude that they serve different purposes. Those who want a convenient and easy-to-carry gym bag with ample space should consider YogaAddict’s Supreme Yoga Mat Bag. It is not only affordable but offers more space and extra pockets than Defender III. However, Adidas is more well-known in terms of brand recognition. We definitely fell in love with YogaAddict’s Supreme, and for a good reason. This gym bag provides everything a gym-freak needs to put their stuff in. It is a high-quality bag that is perfect for anyone trying to lessen their gym hassles. If you want to invest in a long-lasting and convenient bag, then this is your answer. Built to last long, if used carefully, the Supreme will not give you any trouble. With a comfortable size of 30 inches in length, it can fit almost any size of a yoga mat. Not a gym person? Buy it for a friend!